SVALBARD was started as an ambient one-man project in 2006. It’s music was based on the mixture of Dark Ambient and Neoclassic. 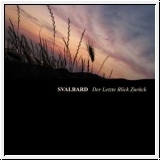 During the winter of 2007 the first demo titled ‘Stille’ was recorded and soon SVALBARD received the invitation to take part in the international fest „Crivia Aeterna“. After the band’s first performance it’s conception was reworked and the following year SVALBARD performed their new program together with the new member [K.S.] who since then has become responsible for the lyrics of the project. After this performance the band received their first contract with „Der Angriff“ (subdivision of Russian label „Indiestate“) and released their first EP ‘Treue Vaterland Jugend’. During spring and the summer of 2009 SVALBARD was working on their first LP ‘Heimkunft’ that was released on the German „Lichterklang“ label in 2010 and gained a lot of respect from fans and media worldwide. 2012 now sees the release of the second fulltime album entitled „Der letzte Blick zurück“ again on Lichterklang, strengthening their songwriting skills and sharpening SVALBARD’s individual character as that, being the perfect blend of pathetic dance hymns and military pop appeal combined with the depth of russian melancholy and new gained folkloristic influences. The album will be released as a standard jewelcase edition including 8-page-booklet, mastered by Axel Frank (Werkraum, Triarii) at the Blue Lounge Studios Berlin.